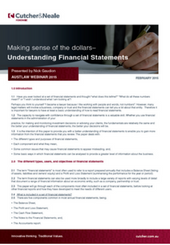 Our goal of "helping you make sense of the dollars" goes beyond just the way we write our reports. 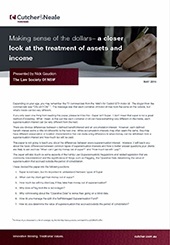 We also present at legal seminars and post articles that we believe will be of interest or provide tips and suggestions on how to avoid poor outcomes for your client. If you would like to find out when we are presenting a paper in the near future click here. Alternatively, if you would like us to present a paper at your legal conference or for your firm, please do not hesitate to contact one of our staff. 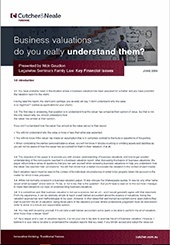 Business Valuations do you really need them? You have probably been in the situation where a business valuation has been prepared for a matter and you have provided the valuation report to the client. When we think about divorce, we generally think first about the people involved. 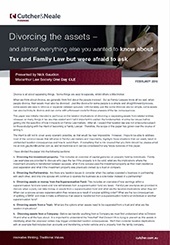 But as Family Lawyers know all too well, when people divorce, their assets must also be divorced. 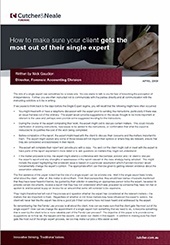 The role of a single expert can sometimes be a lonely one. No one wants to talk to you for fear of breaching the perception of independence. Consider the following scenario. A Husband and Wife are separating after 13 years of marriage. There are two children of the marriage, aged 9 and 13. The Wife has undertaken the primary home-maker role and has no formal training or work experience.